Christina, born 1968, married with 3 children and lives with her family in Castle Pines, Colorado; Damon, More…born 1973, married with one child and lives in east Texas near Kemp. My girlfriend/partner, Bess Salomon, also has two children and one grandson. If I count correctly, that makes a total of 4 kids and 5 grand kids. After graduation I was off to college, actually living in Long Beach, then Santa Barbara, and finally moving to Texas for my career. My parents moved to Saugus right after my graduation so I lost my ties to Torrance. My circle of friends at THS scattered and many of the guys were drafted, plus I got married and started a family, so I never kept the ties to classmates and lost contact. 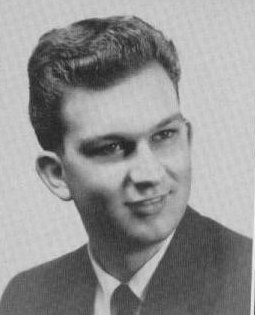 Not a happy story but still vivid: In the fall semester of 1963 my chemistry class was interrupted with news of JFK's assassination. The entire school gathered outside the administration building and Dr. Ahee spoke to us. We usually had pep rallies there so the contrast made it particularly sad. Attended Long Beach State 1965-71, earned B.M. and M.A. ; UCSB 1971-1973 earned Ph.D. Married Carolyn Beck, whom I met at CSULB, in 1967. Moved to Texas in 1974 for a teaching job and was college music professor for 20 years. I was destined to go to college because that's the only option I was given by my parents growing up. Plus, I always wanted to be college teacher, particularly after a school trip to UCLA our junior year. Classes with Mr. Douthright (?) my freshman year - remember this guy? It was like an hour with Robin Williams every day! Since I was a band nerd, most of my time was spent around the band hall and I didn't socialize outside of band. Also, I was already playing gigs every weekend with various dance bands around LA and probably went to more proms than anyone - except they were at other schools and I was on the bandstand. Ha! Study more, work harder, etc. Sound familiar? I didn't socialize with classmates outside my small circle of band buddies and, looking back, that was limiting. Not many parties or dates. But I made up for it in college! Make of your life what you want it to be! Nobody but you can do that. No one will do it for you. Whatever you do, do it to the best of your ability. Being in high school is a difficult time for many kids, mostly because of the age. But we all get through it and life gets better! Ronald Yates has a birthday today. New comment added. 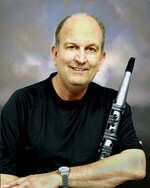 Ron Yates in 2009 - picture taken with a band he played with in north Texas called "Ebenezer" (see EbenezerBand.com) until 2012.